Grand Central Market | Press Coverage | Grub Street | By Sierra Tishgart Like so many chefs these days, former Glasserie chef Sara Kramer left Brooklyn , where her career had just taken off , to move across the country &amp;mdash; in Kramer&#039;s case, to Los Angeles. Like so many chefs these days, former Glasserie chef Sara Kramer left Brooklyn, where her career had just taken off, to move across the country — in Kramer's case, to Los Angeles. 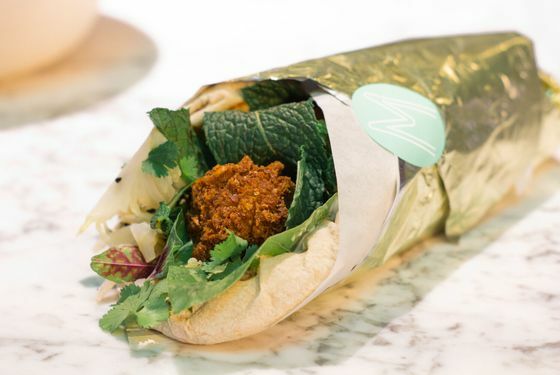 Now she has opened one of the two restaurants she has planned: a falafel shop called Madcapra housed inside the historic Grand Central Market. At the time of her move, Kramer cited a few motivating factors for the departure: "It's just becoming more and more expensive to rent a restaurant in New York," she said at the time, adding that she also wanted to escape New York's over-saturated market. "I wanted to be able to have an impact — and have it not just be the let's-write-about-it-for-a-few-weeks-and-then-it-goes-away sort of thing. It feels now-or-never in terms of trying to do something that has some lasting and staying power." That was a year ago, so Grub checked back in with Kramer to see how her expectations compare to the realities of opening in L.A., and what makes the city more and less challenging than New York. It's hard to say exactly, without having a particular example from a comparable business in New York. 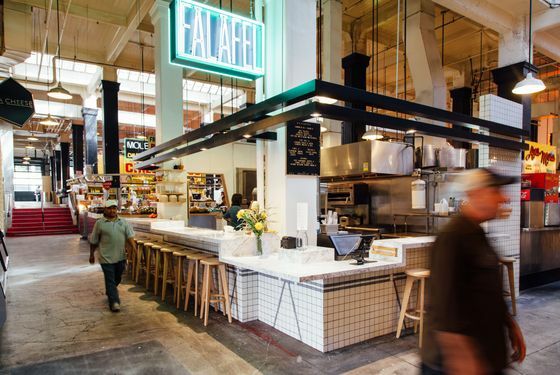 We were approached by the Grand Central Market, and it was the most tangible way to open as quickly as possible. It was a good option to allow Sarah [Hymanson] and I — who are new to L.A. — to get our bearings on the city, and also start working as soon as we got here. But even in a place like that, it's been a long process. And you're working on a second concept, right? More of a classic sit-down restaurant? That is still a ways out, so we’re going in succession here. We’re doing the falafel shop first, and the restaurant second. When we started looking, we were trying to combine the concept into one space, but we didn’t find anything quickly enough, and Grand Central Market is such a awesome place to be. We’ve still been looking for a space, but it’s not that much easier here than in New York. It’s not necessarily easier to go through the entire process of permitting because there’s a lot of very particular regulations in California. I wouldn’t say it’s any less stringent than New York — perhaps it's even more. And L.A. is a big city that has an amazing amount of interest in it right now, so there’s a lot of competition for spaces. We’ve got one person taking orders and three cooks at any given time, and that’s it. I can't be there to cover everybody’s individual break, which I will be doing sometimes. It's an extremely difficult policy for us, as a tiny business. I understand why the rule is there, as far as protecting restaurant workers in very large settings, and more corporate structures, but it really works against us — and unfortunately our employees, because we’re just going to try to keep them for six-hour shifts. I know you brought along your former sous-chef, Sarah [Hymanson], who's now your partner. And Brenna [White], the Smile's former pastry chef, is also onboard. You have such a New York crew! Was this a conscious decision? It hasn’t been so much actively recruiting people, as people coming to us. Brenna also wanted a change from New York and heard that I was coming out here. Another friend who just moved back here was working as a pastry chef at Reynard, and then a line cook at Marco’s, and he is going to help us out for a bit. We’ve been gathering really wonderful people, both from back east and from here, who we're really excited to work with. That’s been a big surprise, as we thought we were going to be scraping for people, because everybody does. I know a lot of people, within and beyond food, who are moving here right now. It is definitely a deluge. It's such a burgeoning scene here. The media and the public are so interested in the ethnic food here, and have really pushed the boundaries of finding the best in the city. In terms of concept, it’s always a little bit tenuous to describe what the difference is between ethnic restaurants and our restaurant — because it’s not that we’re not making slightly ethnic food, but it’s definitely more American and experience-oriented. It’s a more creative and less traditional approach to food — just a higher-concept approach. What people are grabbing onto now here has been seeing a lot of success in New York for a while: a casual experience, like high-class dining on a more approachable level. So I’m very excited to grow here and be welcomed here. People have been really genuine and very welcoming. It feels, like, totally contradictory about what people say about L.A.